The title of the post kinda says it all! Blood and Sin is now out! You can find it here! Ahhh, I'm so, so, so excited to share my newest series with you. It was a blast to write, and did I mention that I got to write it with my husband, Dan Rix? 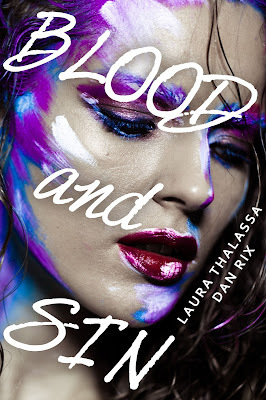 I hope you enjoy reading Blood and Sin as much as Dan and I enjoyed writing it! And if you want to know more about Blood and Sin, read on for the description. Check out Blood and Sin here on Amazon! Only a few more days until Blood and Sin (The Infernari #1) comes out! I can hardly wait! Until then, I thought I'd put up a quick post with the official Blood and Sin playlist! Music is a huge part of my writing, and the following songs really caught the mood of Blood and Sin and/or inspired me while writing it. I hope you enjoy!